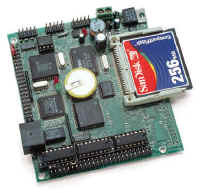 Measuring within 3.9×3.6 inches, the R-Drive™ (RD) is a powerful industrial embedded controller integrated with Ethernet, RS232/485/422 connectivity, CompactFlash for mass local data storage, analog I/Os and solenoid drivers. The wide array of peripherals on the RD makes it ideal for precision data acquisition applications, industrial process control, or simply as a remote communication logger. A total of up to 16 analog inputs are supported. One high-speed 12-bit parallel ADC chip (AD7852) provides 8 channels analog inputs (0-5V), with up to 300K samples per second. A 16-bit ADC (ADS8344, TI) provides 8 single-ended or 4 differential analog inputs (0-5V, or 0-REF) with 65536 counts of resolution at up to 10 KHz sample rate. A parallel DAC (DA7625, 5 ms, 4 ch, 12-bit, 0-2.5V) and 2 serial DACs (DAC7612, 2 ch, 12-bit, 0-4.095V) can be installed to support a total of up to 8 analog outputs. Three RS232 serial ports are available: a Dual UART (SCC2692), and a single CPU internal UART(default used as the DEBUG port). All UARTs have deep FIFOs to minimize the potential of receiver overrun or to reduce interrupt overhead. One UART can be buffered by RS232 (as default), RS485, or RS422. 40+ TTL I/O lines are free to use, including 24 bi-directional I/Os from the PPI (82C55), 32 multiplexed CPU internal PIOs, and TTL I/Os from the DUART. Three dip sockets with 21 high voltage sink drivers can be installed, capable of sinking/sourcing 350 mA at 50V per line. These high-voltage I/O are ideal for directly driving solenoids, relays, or lights. An Ethernet LAN controller (CS8900) can be installed to provide network connectivity. A RJ45 8-pin connector is used to connect to a 10-baseT Ethernet network. A software library is available for Ethernet connectivity. Three CPU internal timer/counters can be used to count or time external events, or to generate non-repetitive or variable-duty-cycle waveforms as PWM outputs. A serial real time clock (DS1337, Dallas) is a low power clock/calendar with two time-of-day alarms. Optional high efficient Switching Regulator (LM2575) provides an external control pin to shutdown 5V and enter A standby mode and wake-up by active-low signal. The RD requires 8.5V to 12V DC power supply with default linear regulator, or up to 30V DC power input with switching regulator without generating excessive heat. Two versions of RD are available: the RD80 is based on the 80 MHz R1100, and RD40 is based on the similar 40 MHz Am186ER. The RD is a particularly powerful board with multiple features. Smaller units are also available, such as the R-Engine, or the TD-40. A board featuring more industrial I/Os + and a higher performnce TCP/IP Ethernet port would be the R-Engine-L.
40+ TTL I/Os, up to 16 high-voltage I/Os, and protected inputs. 256 KW Flash, solenoid drivers.